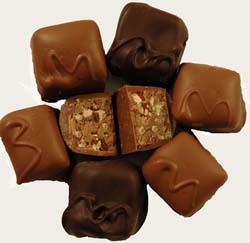 Chocolatey Ganache with large chunks of fresh-roasted pecans, drenched in chocolate. Lovely texture. From Anonymous of Irwin, Pennsylvania on 5/12/2014 .